Florida snakes scare the daylights out of most Yankee visitors and quite a few natives as well. A little bit of knowledge will go a long way toward easing those fears. Of the 45 species of snakes in Florida, only 6 are venomous. Some of the others might bite you, but a few stitches and a tetanus shot will fix you up. Most Florida snakes are harmless and beneficial and remove extra rodent populations. Even the venomous species are not particularly dangerous unless stepped on or otherwise provoked. When most snakes see you they feel threatened and slither away from you as fast as they can. If they can't get away from you, they do all kinds of interesting things to protect themselves. They bite, of course, because they don't have claws to scratch you with. The handsome fellow on the right is an indigo snake, one of the endangered Florida snakes. Some species will defecate and smear the feces on you. Others secrete a musky fluid and spread it on you. As one who has lived in Florida for a long time, my policy about snakes is to leave them alone. I have only been bitten once by a Florida snake, and that was when I accidentally cornered one in the bathroom of a shack I was living in while a student at the University of Florida in Gainesville. It was a black snake about three feet long that bit me on the side of my hand. It happened so fast I didn't see the bite coming. I saw the snake at the same time it saw me. It was coiled in the corner of the bathroom next to the toilet. He sprang up and bit me on the hand as I reached down to lift the toilet seat. I calmly left the bathroom and closed the door behind me (I remembered it's important to stay calm!). I went next door and asked my Florida Cracker neighbor to come take a look at it. He killed it with a machete and identified it as a non-venomous black racer. I thought he might be right, but I wanted a second opinion. I went to the hospital emergency room with the snake in a plastic bag. A doctor told me it wasn't a venomous one, and gave me a tetanus shot, some antibiotic and a band-aid and I went home. I plugged the gap around the bathroom plumbing so no more snakes could come in, if that's how he got in. If it had been a venomous snake, I would have calmly (yeah, right!) driven to the same hospital, kept my bitten hand below the level of my heart, and hope like hell they had antivenom there. By the way, that coral snake to the right is venemous and very dangerous. 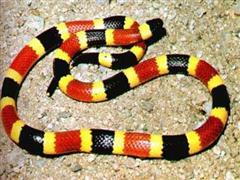 In other words, if the red band touches a yellow band, it's a coral snake. I usually forget the rhyme and just stay away from anything that even remotely resembles a coral snake. The U.S. Food and Drug Administration provides information on snakebite treatment and how to avoid being bitten by a venomous snake. All snakes are carnivorous. Corn snakes, rat snakes, and pine snakes eat rats and mice. Water snakes eat fish and frogs. And so on. They aren't vegetarians. If you live in Florida, snakes are nearby. If you have rats or mice around your house, you will appreciate having a rat snake for a neighbor. Leave them alone and they will take care of your rodent problem. Some species, like the corn snake and green snake, are good climbers and live in trees and shrubs. 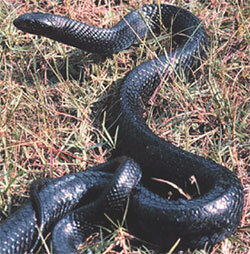 Others, like the indigo snake, coach whip and king snakes live on the ground. Some others, like the brown snake and ring neck snake, burrow in the soil and leaf debris. Some species, like water snakes and rainbow snakes, are aquatic. Pine flatwoods, hardwood hammocks, cypress ponds, wet prairies, Florida scrub, marshes, swamps, ponds and lakes are all snake habitats. The Burmese Python shown above is not an indigenous Florida snake, but has become a real problem, especially in the Florida Everglades. It is assumed that most of the 100,000 or so pythons slithering around Florida are descended from pets that were released into the wild by owners who got tired of them. These pythons can grow to be 20 feet long and eat anything that they can hold with their teeth and constrict to death. This includes deer, small animals, birds and even alligators. These snakes completely destroy the balance of nature wherever they live. 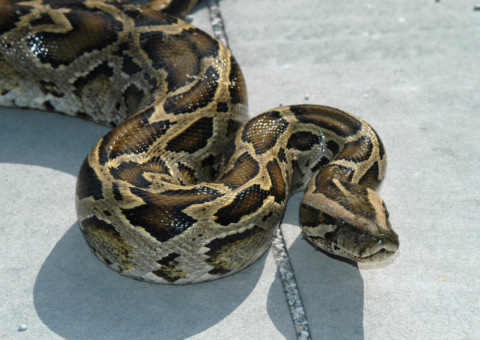 The Florida Fish and Wildlife Conservation Commission issues permits to qualified people to capture and remove pythons. The same agency also issues hunting licenses to people who can harvest the snakes and sell the skins and meat. Snakes are everywhere, they just don't always let you know about it. "Thank God for the miserable summer heat, the mosquitoes and the snakes. If it warn't for them, we'd be overrun by Yankees". One fine point to remember is that herpetologists and snake lovers in general will jump all over you if you call their beloved snake - or any snake for that matter - poisonous. They will tell you that snakes are not poisonous, but some of them are venomous. To be poisonous means to secrete poison, to be venomous means to inject poison. Well, the Florida Crackers learned to live with us, so we can certainly learn to live with Florida snakes. Keep our slithery friends in mind when you are enjoying our many Florida activities. There is a large group on Facebook called "What Kind of Snake is This? Florida." There are a lot of well informed people in that group. I posted my article (above) on that group on January 4, 2019. I asked for comments on the article and received a lot of useful input. Responses are shown below for your information and education. Be careful with that medical advice (even though you may not have provided it as advice, one may assume it's the advised protocol) as it's outdated and/or faulty for the majority/all of our venomous snakes. You don't need to take the snake to the hospital with you - they will know how to treat it without seeing the snake. Call the hospital to let them know you're coming so they can prepare accordingly. It's not always advised to hold the bitten extremity below the heart; this can cause much more damage as the venom (specifically for our vipers) to pool in that area. What I have above is not all encompasing; if you're going to put anything which may be inferred as medical advice, make sure it's in line with the guidance of recognized professionals. 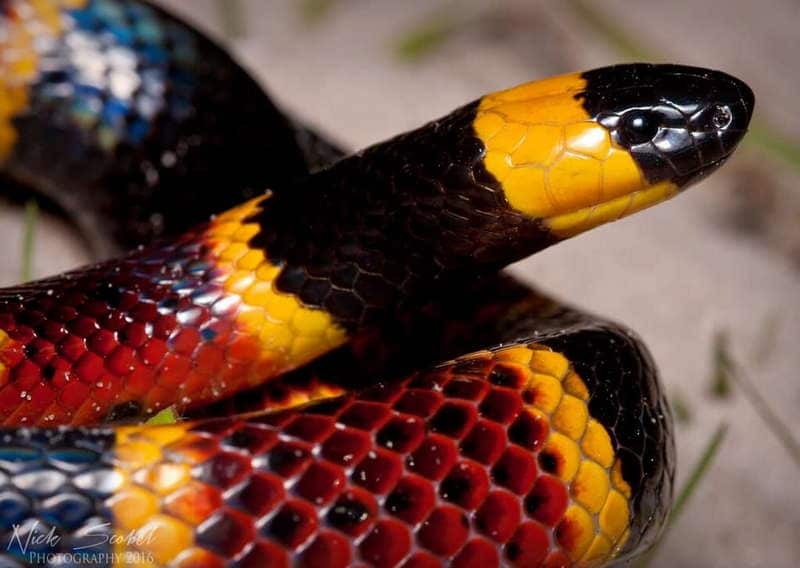 The coral snake you have pictured does not appear to be an Eastern Coral snake. The red/yellow rhyme is not advised due to it's unreliability and that it's often mixed up/confused. In regards to the statement on pythons "These snakes completely destroy the balance of nature wherever they live" - this is true only where they are considered invasive. The ecosystem of the areas of the world they are native to are not destroyed by their presence, rather, they would be necessary. Poison doesn't need to be secreted, instead, ingested. Venom doesn't need to be injected, just needs to have any way to enter the bloodstream. Venom injection is much more dangerous than ingestion. Unless it is injected, there is little chance that the venom will cause a serious medical emergency. Note: This beautiful photo was taken by Nick Scobel, and I hope he won't mind us using it for educational purposes. I like that you stated that snakes typically try to get away from you before they attempt other defensive things. Although you are correct that they might bite defensively, the fact that you mentioned it first makes it seem like it's the first thing the snake is likely to do. I would have preferred to see it listed last, perhaps with a comment to indicate they usually do it as a last resort. I think it would have been good to mention that the first thing they usually do is try to appear scary... like flattening or changing the shape of their heads (which is why head shape is an unreliable method of ID), posturing, shaking their tails (to seem like a rattler). Would then be especially fun if you mentioned the hognose snake, and how it will play dead and is known as the drama queen of the snake world. You might also mention that 2 of the venomous ones (copperhead and timber) are only seen in an extremely limited area of northern Florida, so if you live somewhere else, you only need to concern yourself with 4. My advice was not intended to be limited to Florida. Eastern Diamondbacks, pygmy rattlers water moccasins and coral snakes are liable to be found almost anywhere in Florida. yes, the timber rattlesnake (also known as a canebrake rattler) as well as the southern copperhead are found only in the northernmost parts of Florida. It is possible that one could be found outside of its known range. The southern version of the timber rattler has a more deadly venom than its northern cousins. "The Burmese python is an invasive species which negatively impacts native wildlife in and around the Everglades ecosystem in south Florida. The FWC is encouraging the public to help manage this nonnative constrictor. Pythons can be humanely killed on private lands at any time with landowner permission - no permit or hunting license required - and the FWC encourages people to remove and kill pythons from private lands whenever possible."